Credit goes to my sister-in-law for this great find. Essie’s South American Style Sauce originated in her home state of North Dakota, so she grew up enjoying it. She easily converted the Texas family into true believers! Essie’s Sauce is a blend of soy sauce, vinegar, tomato paste and spices that makes a tasty marinade for beef, pork, seafood and poultry. It is a complex sauce that might be described as an Asian, Mexican, Cajun fusion. It isn’t overly spicy, nor is it sweet; call it unique! Marinating almost any protein in Essie’s for a couple of hours before grilling will bring rave reviews, but it is exceptional with pork. My dinner “crunch-time” trick is to brush boneless chops with Essie’s and pan-fry, while simmering about a cup of Essie’s in a separate pan until it is thick. Top the cooked chops with the reduced sauce, and dinner is done! Essie’s is a gluten-free product that is shelf-stable without refrigeration and the ingredients list includes no preservatives. There really is an “Essie”, Esther Davis. The Davis family opened a restaurant in Dickinson, North Dakota in the mid-1960’s. Their top-selling menu item was a South American steak seasoned with a product purchased from a company in California. When their supplier went out of business, the family was faced with their customers’ favorite entrée disappearing from the menu. Essie and crew went into high gear, experimenting with ingredients until they perfected the sauce themselves. The family says customers soon began bringing in their own “to-go” jars to be filled with the savory sauce, so the next logical step was to sell Essie’s commercially. 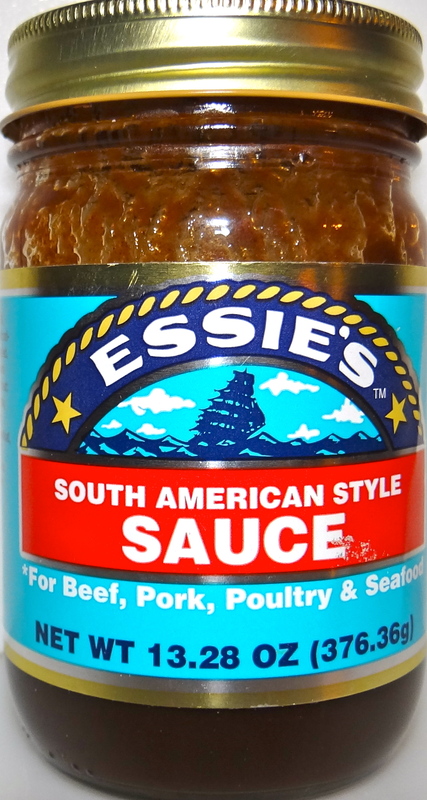 Although the restaurant has closed, Essie’s South American Style Sauce is still a staple in the region and is now distributed from Seattle. Essie’s website isn’t fully operational at the time of this post, but it does provide a link to order from Amazon. Where could I order one bottle by mail. Amazon only offers by the case. ? I heard this is really good but have never tried . Can’t buy a full case . Unfortunately, we haven’t found a place to order a single jar. I believe the South American sauce recipe originated at a supper club called The Gourmet House, owned by Bob and Eileen Clifford, in Mandan, North Dakota. You can order Essie’s South American Sauce by the 1/2 Gallon on Amazon now with free shipping. Essie’s South American Sauce originated at the Seven Seas Restaurant in Mandan North Dakota made by Barry and Esther Davis!